This year’s Academy Awards made headlines for the unfortunate “Best Picture” gaffe that happened near the end of the show, but we think there were many more attention-grabbing events happening. Namely? The red carpet. We compiled a list of our favorite Oscars dresses to give you some serious closet envy, or inspiration for this coming spring season. Here are our favorite dresses from the Oscars. Emma Stone at the 89th Annual Academy Awards held at the Dolby Theatre at the Hollywood & Highland Center in Los Angeles on February 26, 2017. Out to impress, Emma showed up in an intricate gold-tone Givenchy number that featured an intricate bodice and mid-thigh fringe that continued down to the hem. This dress pays homage to the classic ‘40s flapper look, and the “La La Land” actress did it justice. Olivia Culpo at the 89th Annual Academy Awards held at the Dolby Theatre at the Hollywood & Highland Center in Los Angeles on February 26, 2017. It looks like the fringe trend is making a red carpet comeback. Olivia stole the limelight in a flapper dress similar to Emma’s, but from Marchesa rather than Givenchy. We’re so smitten with the dainty details and that thin bow belt that capped off the whole look. Taraji P. Henson at the 89th Annual Academy Awards held at the Dolby Theatre at the Hollywood & Highland Center in Los Angeles on February 26, 2017. Rather than competing with the bejeweled dresses that other celebrities wore, the actress opted for a velvet off-the-shoulder gown from designer Alberta Ferretti. It was striking in its simplicity and fit Taraji perfectly. Hailee Steinfeld at the 89th Annual Academy Awards held at the Dolby Theatre at the Hollywood & Highland Centre in Los Angeles on February 26, 2017. The young actress pulled out all the stops in this ball gown adorned with ruffles from Ralph & Russo. Emma Roberts at the 89th Annual Academy Awards held at the Dolby Theatre at the Hollywood & Highland Centre in Los Angeles on February 26, 2017. The actress did not disappoint in a black and beige lace dress from Armani Prive that showed off her svelte figure. Scarlett Johansson at the 89th Annual Academy Awards held at the Dolby Theatre at the Hollywood & Highland Centre in Los Angeles on February 26, 2017. This feminine dress contrasted with Scarlett’s edgy haircut, and we think this cut definitely worked in favor of the actress. Priyanka Chopra at the 89th Annual Academy Awards held at the Dolby Theatre at the Hollywood & Highland Centre in Los Angeles on February 26, 2017. We loved the unique architectural cut and the geometric print on this incredibly unique Ralph & Russo creation. 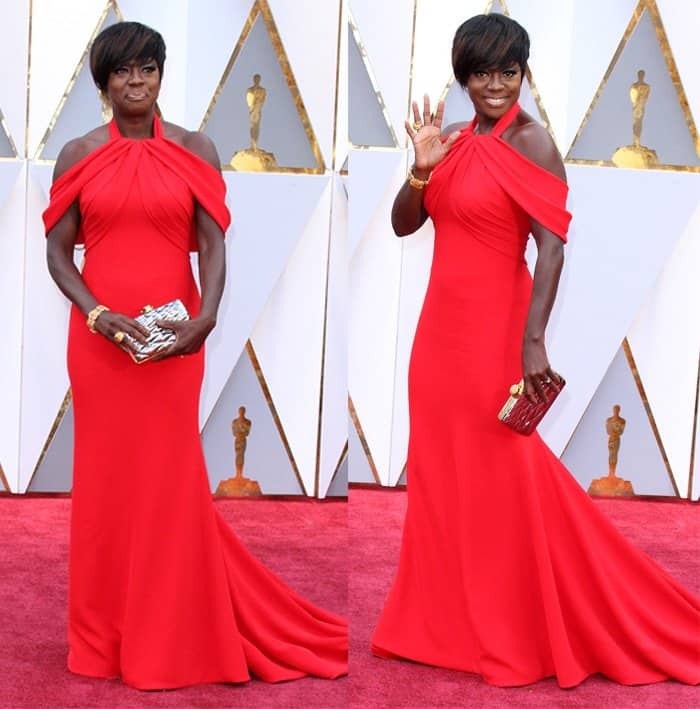 Viola Davis at the 89th Annual Academy Awards held at the Dolby Theatre at the Hollywood & Highland Centre in Los Angeles on February 26, 2017. Way to add more color to the red carpet! This Armani gown suited the veteran actress to perfection. Teresa Palmer at the 89th Annual Academy Awards held at the Dolby Theatre at the Hollywood & Highland Centre in Los Angeles on February 26, 2017. It’s hard to believe the actress gave birth just a few months ago. She looked amazing in this silver-tone Prada dress that showed off her amazing post-baby body. Salma Hayek at the 89th Annual Academy Awards held at the Dolby Theatre at the Hollywood & Highland Centre in Los Angeles on February 26, 2017. The actress exuded royalty vibes in this Alexander McQueen sheer gown. Jessica Biel at the 89th Annual Academy Awards held at the Dolby Theatre at the Hollywood & Highland Centre in Los Angeles on February 26, 2017. This conservative dress could have easily been overwhelming but on the actress, it was just right. Jessica definitely pulled off this statement piece. Dakota Johnson at the 89th Annual Academy Awards held at the Dolby Theatre at the Hollywood & Highland Centre in Los Angeles on February 26, 2017. 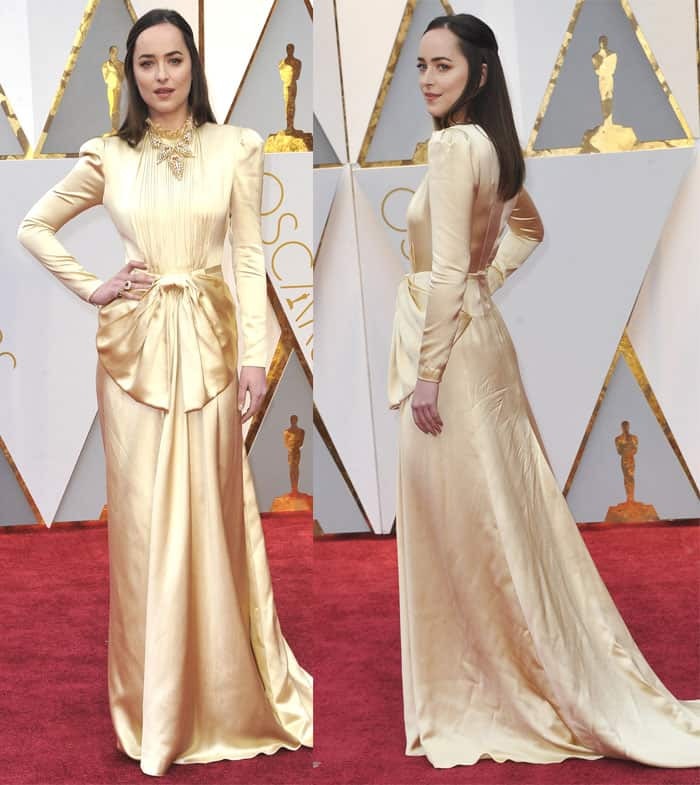 There were so many gold-toned dresses on the red carpet of the Oscars that it could have been easy to overlook Dakota’s satin dress. However, the design, silhouette and styling were executed well enough that we’re willing to overlook the wrinkled fabric. What do you think of our picks? 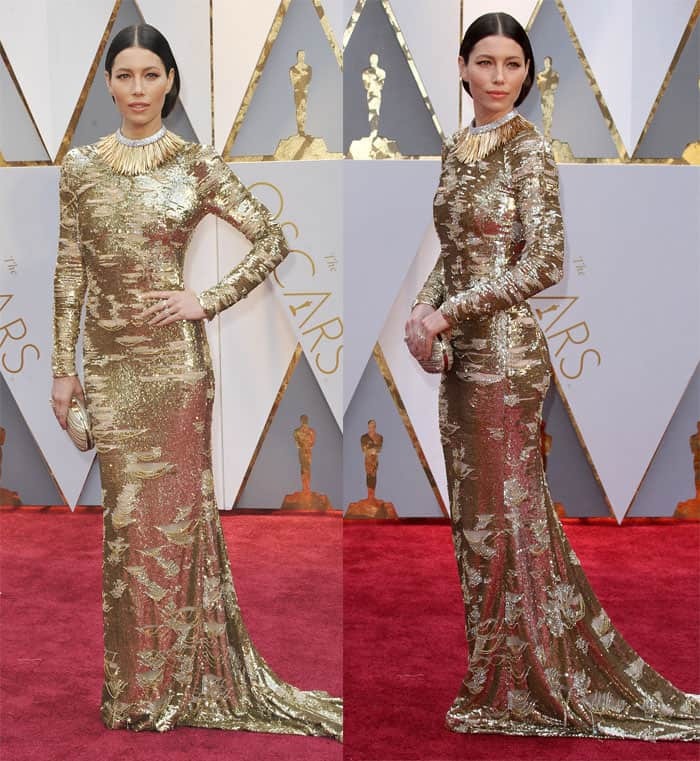 Which Oscars dress is your favorite?